Amid Controversy, India's Reserve Bank Chief Announces Resignation : The Two-Way Raghuram Rajan was a U.S. resident, educated in both India and the United States. 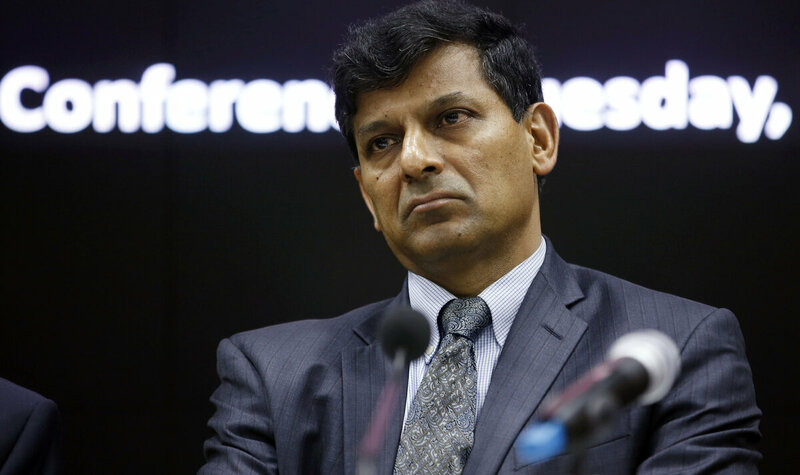 That C.V. and questions on policies put Rajan in the line of fire. Reserve Bank of India (RBI) Governor Raghuram Rajan. The move has sent shockwaves across India's financial sector: Raghuram Rajan, the governor of India's Reserve Bank who's been buffeted by political attacks, announced that he will be leaving. The 53-year old economist had said he was open to a second term, but will instead be returning to academia in the United States when his three-year tenure is up in September. There has been intense speculation about whether Rajan, who had been appointed Reserve Bank chief by the previous government, would serve a second term under the administration of Prime Minister Narendra Modi. Industry leaders and the political Opposition rued Rajan's decision. "India is the loser," wrote P. Chidambaram who was Finance Minister when Rajan was appointed. One of the top trade bodies, the Associated Chambers of Commerce and Industry of India (Assocham), said it was not a good sign for the Indian economy. During his time as Governor of India's Reserve Bank, Rajan halved inflation, cut interest rates (not aggressively enough for his critics), and stabilized a rupee that was in free-fall when he arrived on the job in the fall of 2013. During his tenure, India became the fastest-growing economy in Asia. In a note to Reserve Bank of India staff announcing his decision, Rajan said, "We have worked with the government over the last three years to create a platform of macro-economic and institutional stability." But did he opt out or was he forced out? Rajan was a fresh face in India's staid banking bureaucracy, the former International Monetary Fund chief economist who boldly forecast in 2005 the financial crisis of 2008. A marathon runner with a dashing demeanor, he was quickly dubbed "Rockstar Rajan." Rajan had a reputation as pragmatist who could calm skittish investors and attract foreign capital. However, Rajan comfortably ventured beyond the usual remit of a banker. He spoke publicly about issues of intolerance in India following the deadly attacks last fall on Muslims over bans on beef that exist across the country where a Hindu majority considers cows sacred. Rajan was alternately admired and scorned for his outspokenness. The Sunday Express newspaper said today, "the trust deficit was deepening," between Rajan and the government establishment on a range of issues, and a disdain for him was taking "root within the BJP," Modi's ruling party. Reports suggest differences over an enlarged role for the Reserve Bank, including a proposed cabinet post for the governor, but the government wasn't interested. There were insinuations about Rajan's credentials and even loyalties. Rajan received degrees from prestigious universities in India and the United States and taught finance at the Booth School of Business at the University of Chicago. But the Express said, the BJP "saw red in his American CV." BJP Parliamentarian Subramanian Swamy launched a no-holds-barred attack on him in May, accusing Rajan of wrecking the economy with his interest rate policy and then said the RBI Chief was "mentally not Indian." The fact that Rajan holds a Green Card, a document that gives legal permanent resident status to someone in the U.S., was also raised as if to suggest it compromised allegiance to India. The lack of any robust condemnation of the Swammy's remarks by the government is said by Indian media to have persuaded Rajan and his closest associates against seeking a second term. Rajan made clear, however, there was plenty left to do, including clearing the massive bad loans burdening India's banks. Hours after Rajan's announcement, Modi's Finance Minister Arun Jaitley said, "The government appreciates the good work done by him and respects his decision. A decision on his successor would be announced shortly." Rajan says he will return to the University of Chicago to resume teaching in the fall. "I will, of course, always be available to serve my country when needed," he wrote. But, he added, "I have always made it clear my ultimate home is in the realm of ideas."